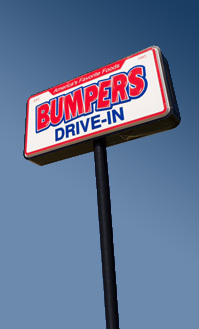 The idea for Bumpers Drive-In of America was conceived in 1983. Bumpers Drive-In is a quick-service drive-in restaurant that combines the atmosphere of the classic drive-ins of the '50's and '60's with modern equipment and techniques. The result is a nostalgic restaurant with high-quality cooked-to-order food served quickly in the convenience of your car by our friendly carhops. 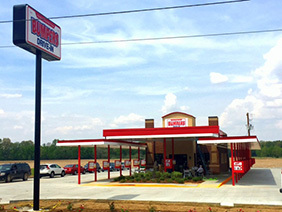 With 26 locations throughout Mississippi, you are sure to find one near you. 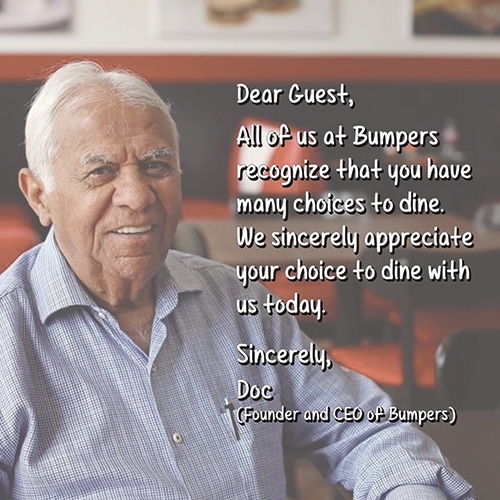 The Bumpers menu features burgers, fresh-cut, hand-battered onion rings, chili cheese dogs and many other hometown favorites. We also offer unique items you simply won't find at other fast food restaurants including our line of philly and hoagie sandwiches, dinner baskets, strawberry shortcake and hot fudge cake desserts, fried dill pickle-o's, and Jumping Jack Fries. And no one can forget our famous Bumpers Biggie Bag with hot apple pies!